In this tutorial, you will learn how to use the REAPER Audio statistics and volume plug-in called JS: Schwa: audio_statistic and JS: Utility/Volume. Retrieving and monitoring volume statistics data is very important for audio mixing and mastering for implementing proper gain staging. 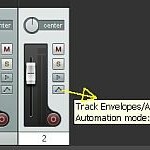 Let’s illustrate using two common implementations so that you will know how to use this plug-ins in your mix. This assumes you have fully installed REAPER in your computer as well as the needed plug-ins. STEP1.) Launch REAPER and go to Insert — > Media file. You will need to load the audio you are going to edit. Find it on your hard drive. 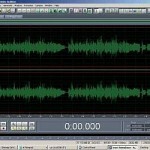 For best results, make sure the audio format should be a WAV file (16-bit or 24-bits audio). STEP3.) Make sure that the volume adjustment is initially set to “0” dB. This is important because you are not still adjusting the volume as of this moment. STEP4.) Play the audio from start to finish. The audio statistics plug-in will measure the current volume in RMS dB. Read this post if you don’t understand what does RMS means. For example in the above data; the current loudness/volume is -18.22dB for LEFT channel and -18.04dB for the RIGHT channel. There are two data because the source audio is in stereo. Take the average of these, so it will be: (-18.22dB + -18.04dB)/2 = -18.13dB. 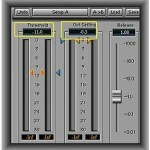 Go to Volume plug-in and enter -1.87dB as the adjustment value. This will reduce the overall volume of the audio by -1.87dB to aim -20dB RMS. Just leave the maximum volume to 0dB. However maximum volume setting is important particularly for increasing the volume so that it won’t exceed 0dB which results to clipping or distortion. STEP6.) You can confirm that the volume adjustment setting is correct by playing the audio again. This time the RMS volume total should now be -20dB. 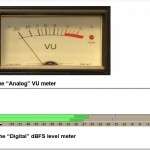 It shows that the new loudness level is around -20dB RMS which is correct. STEP7.) Now you have the correct volume, you can then export/render the audio in the same format. First remove the audio statistics plug-in so that only the volume plug-in is left. These will speed-up the rendering process which you will be doing later. STEP8.) Go to File — > Render. You need to assign a file name. Ensure that the sample rate, output format and bit depth should be the same as the source file. 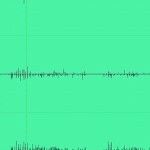 For example, in the above rendering settings; the output format is 16-bit/44.1KHz WAV. The source audio is using the same format. Finally click “Render 1 file”, and the file will be rendered. 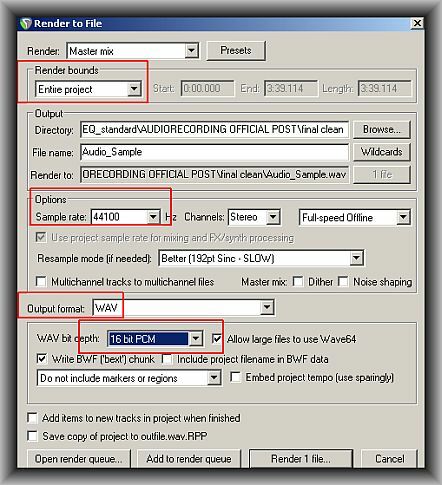 Now you have the adjusted file in WAV format, you can then convert that to MP3 using LAME encoder.